Instagram today announced several new ways people can interact with one another via the social network. First, it has added the ability to ask friends for music recommendations, or to make your own recommendations, using the questions sticker. A new music icon appears in the sticker that lets people browse or search through the music library and then share. Opening the viewer's list will reveal all the responses and recommendations. Instagram says people can take a picture or video as the music plays in the background. New effects in the camera respond to the beat of the music. These features are rolling out for Android and iOS in select regions. Second, Instagram says people can use the question sticker in Live to interact with people in real time. When users go Live, a "Q&A" indicator will show up in the stories tray. Join the Live video to see questions and answers as they happen. Those broadcasting Live can share photos and videos from their camera roll directly to the Live feed. 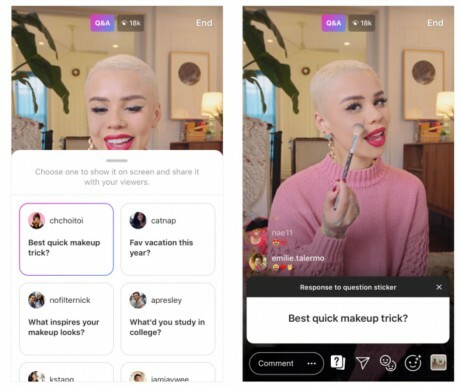 Instagram says questions in Live will be rolling out on the latest version of Instagram for iOS and Android starting today. Last, Instagram has added a new interactive countdown sticker for stories. It lets people count down to upcoming moments, such as holidays, with their friends. People can follow the countdown and they will receive a notification when the countdown ends. Once users create a countdown, it will remain available for use in other stories. This feature will reach all users globally today. Instagram today revealed several new features meant to help connect and protect users that it will add over the next few months. First up is video chatting. Instagram today rolled out new sticker tools meant to help people be more creative in their posts and stories. First up is the ability to turn your selfie into its own sticker. Instagram has integrated shopping deeper into its mobile app. The latest version of Instagram, which people use to share photos and videos, adds a shopping collection, or a way for people to save potential purchase items for later.